Contactless smart cards, from INFINEON (IFX), MIFARE®, LEGIC® & Co.
Contactless RFID / NFC or transponder cards can be found in many applications today. The contactless technology of RFID card enables fast, uncomplicated reading of secure data. Learn more about RFID technology and how to use it. What are RFID cards / Contactless integrated circuit cards? RFID (radio-frequency identification) chip cards are cards that don’t require direct contact with the corresponding reader for data exchange. RFID cards have 3 different ranges: Close Coupling (up to 10cm), Remote Coupling (up to 1m) and Long Rage (over 1m). 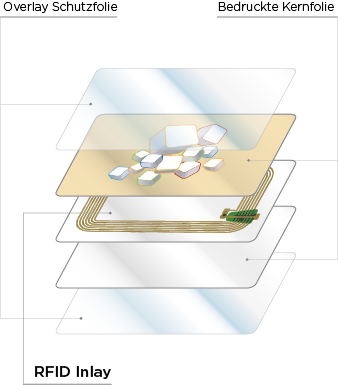 RFID allows transmission from an active reader to a passive storage medium (card). With a magnetic field, the passive chip card gets power and can be read out. What’s the difference to NFC smart cards? Near field communication (NFC) is part of RFID technology and refers to a standard created by the contactless payment function. NFC ranges from 1-4 cm to a maximum of 10 cm – depending on the chip type. This ensures that data is not transferred unintentionally. In addition, NFC transmission also allows data to be received, unlike RFID. Die Datenübertragung bei der kontaktlos Technologie funktioniert über Funkwellen im LF, HF oder UHF Bereich und wird über eine Spulenantenne in der Karte übertragen. Diese Antenne wird neben der Datenübertragung auch zur Energieanspeisung des Chips verwendet. Das Funksignal des Lesegerätes sendet hierbei genug Energie über die Antenne damit der Chip betrieben werden kann. Die Kartendicke beträgt auch hier in der Regel 0,76mm oder 760µ. Das Format der Karte ist allerdings, im Gegensatz zur kontakt-Chipkarte, nicht auf das ISO ID-1 Format (86x54mm) beschränkt, sondern kann auch andere Formfaktoren haben. Es gibt unterschiedlichste Chiptypen für die mannigfaltigen Anwendungsgebiete und Anforderungen in der Praxis. The data transmission in contactless technology works via radio waves in the LF, HF or UHF range and is transmitted via a coil antenna in the card. This antenna is also used in addition to the data transfer for energy supply of the chip. The radio signal of the reader sends enough energy through the antenna so that the chip can be powered. The card thickness is here usually 0.76mm or 760μ. Unlike the contact smart card, the format is not limited to the ISO ID-1 format (86 x 54 mm), and can have other form factors. There are a wide variety of chip types for the manifold application areas and requirements in practice. Special attention must be paid to the position of the chip, as it can lead to significant misprints in the subsequent personalization. In normal card printers the slight unevenness can lead to dropouts in photos, text and barcode personalization. For this reason we recommend to personalize RFID cards exclusively in retransfer printing. The application areas are manifold and range from solutions for payment, public transport up to access and individual solutions for canteens or retail, as a voucher or bonus card. In addition, contactless smart cards are becoming increasingly popular for transmissions using smartphones, which are based on NDEF and NFC technology. RFID cards fundamentally differ from contact cards. The smart card is read or written without physical contact to the device, resulting in less wear and a longer life. In addition, the chip of a RFID / NFC card, is usually implanted “invisibly” into the card. The standard of RFID cards is specified in ISO 14443. Most common chip types are available in stock in form of white blank cards. You can also order them printed in offset or screen print. 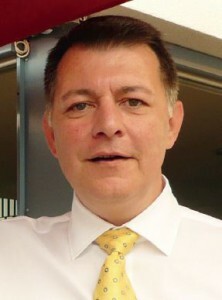 Die Hauptanwendungsgebiete für RFID Chipkarten sind Ausweiskarten wie Schüler- und Studentenausweise, Kundenkarten, Fahrkarten für den öffentlichen Verkehr und überall sonst wo berührungslose Transaktionen stattfinden sollen. RFID cards for access management and time recording based on MiFare® or Legic® solutions. We offer you production and coding of your cards. For student ID cards, RFID cards are suitable, for example, to store monetary values ​​for canteen or copier. In addition, they enable presence control and ease access to facilities such as libraries or IT rooms. RFID cards as customer cards allows additional interaction with the customer at the POS. Clients are given access to special facilities or they can check current scores in conjunction with NFC technology and their own smartphone. RFID / NFC technology enables completely new ways of interacting with customers. Identification cards and tickets in form of annual passes for public transport. With photo personalization, tickets can also be used as ID cards at the same time. The contactless technology enables very short waiting times at the POV (point of validation) and thus contributes to user satisfaction. We have the following chip types / transponder cards & suppliers in our product range. Combinations and hybrid cards are also possible. If you need another chip, please call us or send us an email. Questions about RFID or NFC cards? We help you to implement your RFID or NFC project. Please don’t hesitate to contact us.